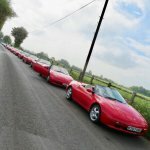 Lotus Elan Central • View topic - What are Lotus thinking about? What are Lotus thinking about? Re: What are Lotus thinking about? The bloody vid won't play on my iPhone unless I down load some random chuffing media player, they really don't have a clue. Tiz good news thou.... There won't be many more Lotus cars on the road before they go into liquidation. 10% profit this year, what do you reckon for next! What in the name of bloody hell? Why don't they just change the name of the company and have done with it. FFS! Personally, I think it's just a tongue in cheek video produced by Lotus, for a bit of publicity. Clearly, in trying to get the local employees round to his way of thinking, Dani has not quite grasped the concept of sugar beet. I wonder where Lotus got their idea from to "recruit" Swiss Beatz to the bu**s*it title of Vice President Of Creative Design And Global Marketing, as well as the idea for the wording of their press release ? It’s very clear from our first few sessions that she is a creative tour-de-force, and a key player on the Polaroid team. We all know Lady Gaga as a creative artist, but she’s also proving her tech savvy. The partnership is all channeling Lady Gaga’s fashion sense to create innovative products with her fans in mind. The collaboration will deliver new products that mix the best of “instant” with digital era multi-media. Lady Gaga has a personal connection to the Polaroid experience that she wants to share with the world through the introduction of products that will appeal to a new generation –building on the Polaroid movement into the future." Truly, you couldn't make it up! If both of these these appointments aren't parody, then parody must now be dead. How do you parody a reality like this?? Thanks for keeping us in the picture! Just another thought, if he's the Vice President Of Creative Design And Global Marketing who's the President Of Creative Design And Global Marketing ? Prince Andrew?? Ooops, sorry, that's parody and it's now dead! Specky wrote: Thanks for keeping us in the picture! It's an anagram of bisected airplane avoids fervent dogleg making cretin Roland. "Ever More Crap focking Italian Design ideas event"
The Lotus Forum is running a poll to see what the reaction is to this appointment. When I voted it was evens between 1 (really bad) and 6 (really good), no doubt influenced by Swizz Beatz encouraging his fans via Twitter and his Swizzworld website to respond with votes in his favour. What do you think of the move? Vote in the poll now! Brotha that one phat motor. Dem paint is well slammin? Fink dem lotus Elan well old skool innit. F**king minging. Dem Evora is where its at You get me. Respeck. Apparently this demographic is more likely to buy a new Lotus than us.